There are many spectacular waterfalls in Tasik Kenyir, These waterfalls are popular spots for picnicking as they provide a cool, relaxed and rejuvenating ambience that awaits its visitors. A picnic at these falls is featured in almost every itinerary. Better basic amenities like toilets, changing rooms and rest areas are provided at these popular spots. Lasir-Located 16 km(20-30minutes boat ride) to the south of Pengkalan Gawi, is one of the most popular picnic spots in Tasik Kenyir. With a majestic fall of some 500 feet, Lasir drops gracefully onto a multi tiered level of boulders and rocks forming cascading showers of foaming white sprays of the water. 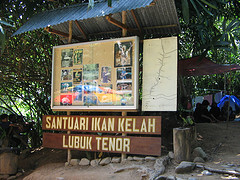 This waterfalls, as with all waterfalls within Kenyir, is well shaded by the leafy green canopy of the surrounding tropical rainforest. 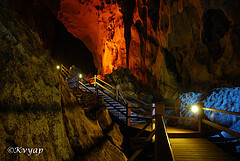 Saok-A mera 15 minutes boat ride from Pengkalan Gawi, Saok Waterfalls is fast gaining popularity among holiday makers. Cascading waters over its rocky terraces and boulders and a flat sandy area at ground level make it a perfect picnic spot for the whole family. 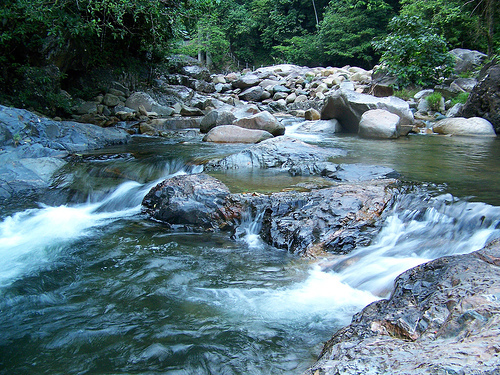 Tembat-Unlike Lasir and Saok, Tembat Waterfall is actually composed of five rapids of fast flowing cascades. With a large camping area at its side, it is without doubt, the most popular destination for campers. A hiking trail leading to the top of the fall rewards the hiker with a magnificent view of the waterfall and its surroundings. A boat ride from Pengkalan Gawi to Tembat takes about an hour. 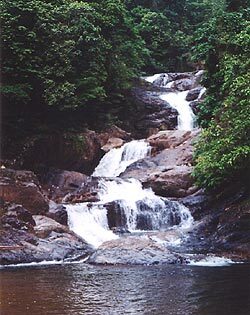 Other waterfalls within the Lake is the Petang, Leban Terengganu, Lata Terap, Sg.Buih, Sg.Lawit and Petuang.